Congratulations to Philadelphia Eagles' player Michael Vick! The former Atlanta Falcons quarterback got married to his longtime girlfriend, Kijafa Frink. Last weekend at the Fountainebleu Miami Beach resort, Vick and Frink exchanged vows before 300 friends and family members. Guests included running back LeSean McCoy and head coach Andy Reid, Atlanta Falcons wide receiver Roddy White, free agent receiver Plaxico Burress and retired New Orleans Saint Aaron Brooks. Vick's wedding party had a tropical theme, pairing tuxes with pink and purple shirts. Guests ate well, having a reception menu of oysters, shrimp, lobster, and chicken and waffles. The resort's pool area was invaded by 3,000 people for the radio website iHeartRadio's Ultimate Pool Party with private concerts by Gym Class Heroes, Maroon 5, and Flo Rida. 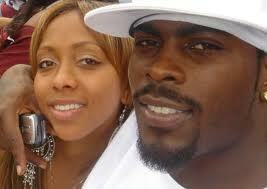 The nuptials reportedly cost Vick more than $300,000. Vick is known for serving prison time for a dogfighting case. So what do you think? They are a very cute couple and Vick didn't do too bad! Blessings to them.